UCF College of Education Professor Timothy Blair has hosted free reading campus for underserved children in Parramore for 13 years. Nearly 13 years ago, University of Central Florida professor Timothy Blair hosted his first Saturday Reading Camp for underserved children in the Parramore neighborhood of downtown Orlando. By the time the College of Education professor retires later this year, Blair will have influenced the lives of more than 2,500 students in Orlando’s poorest neighborhood through his free weekly tutoring program. And for that, the City of Orlando has declared Monday, March 25, as Dr. Timothy Blair Day. Blair will be recognized during Monday’s City Council meeting. Blair created the Saturday Reading Camp as a way for his undergraduate and graduate students to apply the strategies they learned in the classroom to a real-world environment. Each week, the students in his reading education classes provide individualized reading lessons and write lesson plans. The camp began at the Jackson Community Center and has since expanded to the Callahan Center. For 11 consecutive Saturday mornings in the fall and spring, children from kindergarten through sixth grade receive reading lessons led by UCF students. Consecutively, Blair runs a Parent Education Program with the children’s parents and relatives, in which he teaches hands-on strategies for teaching their children reading at home. A Summer Reading Camp is also held daily in June. In addition to working with Orlando’s Department of Families, Parks and Recreation, Blair has received funding and supplies from Scholastic , Starbucks, private donors and local schools. At the end of each session, Scholastic provides participants with a backpack full of new books to start their own home libraries, so that they can continue their studies after the program is over. Thirty-five students from the College of Medicine’s charter class participated in Match Day 2013. The University of Central Florida celebrated a milestone today when its charter medical school class of students placed in residency training programs across the country. Students are pursuing a variety of specialties, from primary care to highly competitive sub-specialties like neurosurgery, diagnostic radiology and orthopedic surgery. They will train in hospital programs across Florida, including Orlando Health and the University of Florida, and across the nation, including the Mayo Clinic, Duke, Tufts, Brown and the University of Washington. 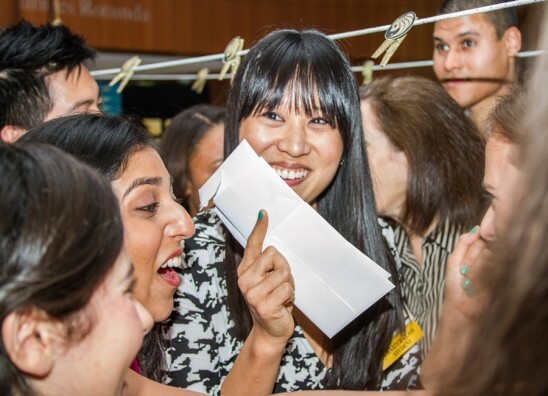 Thirty-five students from the College of Medicine’s charter class participated in Match Day 2013. More than 40,000 participated nationwide. Most medical institutions will not hire doctors unless they complete a residency, so there’s a lot riding on Match day. Results are kept secret until noon EST on national Match Day. The match is similar to an online dating service. Medical students select their preferred residency program from a list of possibilities nationwide. Residency programs housed at universities and hospitals alike list their top picks. A centralized computer spends weeks sorting and coming up with the best “match,” which is announced on the designated Match Day. There was a lot of anticipation leading up to Friday at UCF and beyond. The community eagerly awaited results after donating more than $6.5 million to fund full scholarships for every student in the class of 2013, making UCF the first medical school in U.S. history to provide full scholarships to an entire class. The scholarships provided $160,000 for tuition, fees and living expenses for all four years of medical school. Students stood in front of an overhead banner where gold glittered clothespins held sealed white envelopes. Each envelope held a letter telling them where they had placed. As the medical school clock tower struck noon, the class, their families, donors, faculty and staff began counting down at 10…9…8…At “1” students tore into their envelopes to get the news. Tears, laughter and cheers erupted throughout the halls. Hugs and tears were common as parents and donors congratulated their students. The College of Medicine was the first building to call Medical City home. Today the growing biomedical cluster located near the Orlando International Airport includes Nemours Children’s Hospital, Sanford-Burnham Medical Research Institute, a University of Florida Research and Academic Center and the Orlando VA Medical Center under construction. Collaboration among these institutions and hospital chains such as Orlando Health and Florida Hospital also gave the charter class students unique opportunities for hands on training. The match is the last big hurdle for charter class medical students before graduation on May 17 and the start of their medical careers. Competing for the Black and Gold on the nation’s grandest stage, Aurieyall Scott made history on Saturday night. The junior track and field star became UCF’s first NCAA champion of any sport by claiming first place in the 60 meters at the NCAA Indoor Championships. She joins an elite group of Knights who have won national championships: cheerleading (UCA; 2003, 2007) and volleyball (AIAW; 1978). Scott matched her personal record 7.13, which is fifth-fastest time in collegiate history and makes her the fourth-best performer in the event all-time. She edged Oregon’s reigning champion English Gardner (7.15) and was joined on the medalist stand by her teammate and roommate Freeman, who earned her second bronze medal with a season-best time of 7.16. Coupled with their silver and bronze finishes in Friday’s 200 meters, UCF’s dynamic duo were responsible for scoring the most points in program history (30) at the NCAA Championships for the Knights’ best finish ever at fifth place. After their performances this weekend, Scott is now an 11-time All-American and Freeman is a six-time All-American. UCF opens the outdoor season Saturday in Orlando with the first of its two home meets. The Black and Gold Challenge will start at 9 a.m. with the javelin at the UCF Track and Field Complex.